to see some awesome Halloween-inspired creations. I am often amazed at the talent and creativity I see as I cruise blogs, and this linky party definitely does not disappoint. Today, I've decided to show a few more of my Fall and/or Halloween- inspired quilts. I already showed you my favorite pumpkin wall hanging and placemats, my Maple Leaf Log Cabin, the small fussy cut pumpkin quilt, but I have a couple other quilts that I've made that were inspired by this time of year. I no longer own some of these quilts, but I do know that they are all being used and loved by someone that I love. I love the colors of Autumn and find myself drawn to them frequently. 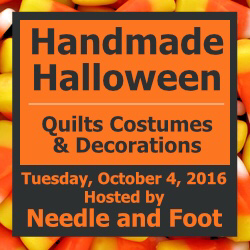 Even if I had no intention of making a Halloween quilt, sometimes it just happens. This is Sadie's quilt. From the front, it looks innocent enough, although it is a spider web pattern. 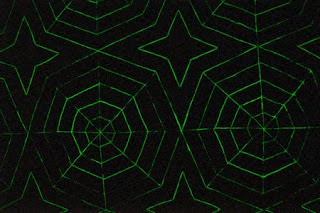 I usually see the secondary star pattern before I see the spider web, so it really could pass as a non-Halloween quilt. But, check out the back! I used glow in the dark thread from Superior Threads when I quilted this and I LOVE how it looks. This quilt is one of my all-time favorites because I love the fabrics. It's simple (small rail fence blocks on point made from a large variety of cheddar fabrics with alternating small squares of shirting fabric), but I LOVE it! I gave this to a very good friend who needed to know that she is loved. Knowing that she still uses it makes me smile. 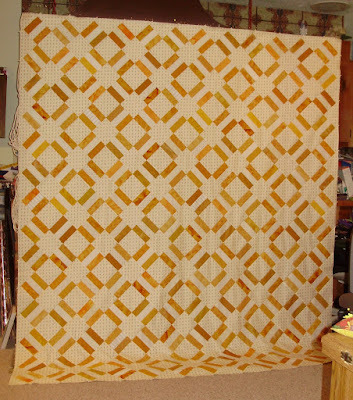 Here is a Fall quilt that I still own. 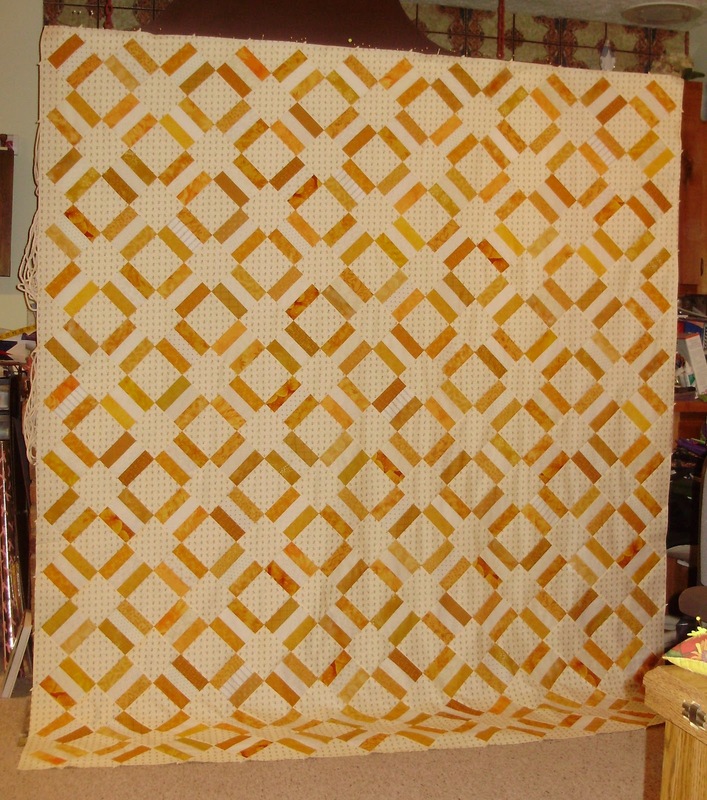 It was my first Judy Niemeyer quilt, Glacier Star, done in Fall-inspired fabrics. 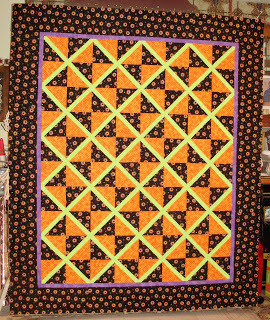 And finally, another quilt that has absolutely no Halloween fabrics in it, but it is THE Halloween quilt according to my grandchildren. Unfortunately, this picture does not do this quilt justice so I just took the quilt outside and threw it on a chair to get a couple of quick pictures. for some Halloween Eye Candy! Isn't it amazing how natural light does wonders for pictures. The colors are totally different (and VERY Halloween like) on that quilt when it was photographed outside. Thanks for sharing your projects! 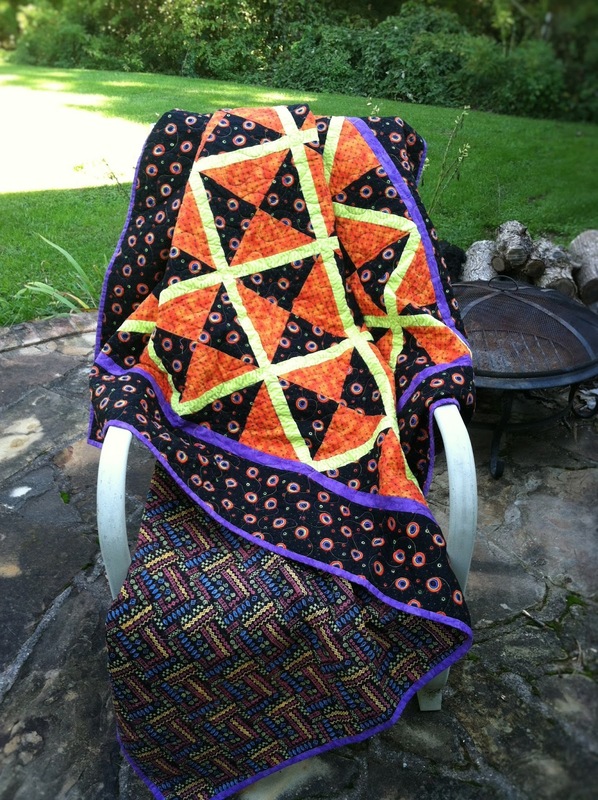 What fun quilts - I have been enjoying your older quilts too - that is a good idea to sort them by years. That glowing thread is so awesome! Such a cool detail. It DOES scream Halloween! What a fun quilt to wrap in when you get skeeered! heehee! 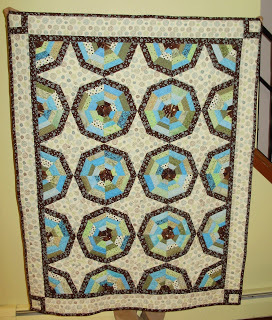 Love your quilts..what talent you have! Hugs! What a great quilt show! Each is lovely in its own way, Glacier star is just amazing, and the glow-in-the-dark spiderwebs are too cute. 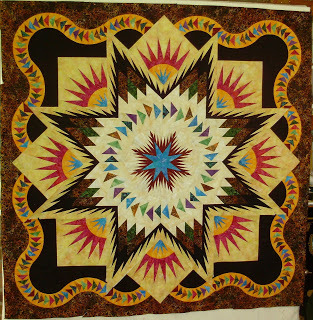 We have a few guild members who are huge Judy fans and make the most amazing quilts - just like yours. Oh, I see eye-balls - so screams Halloween to me. Great quilts. I love that glowing thread! I LOVE Halloween! Mermaid Tail was a Success!